Presented here, a RARE English Pearlware Mocha Mug of heroic proportions! Banded in brown with white, brown and olive slip margling on the rust field . . . the handle with exaggerated foliate terminals. Height is 6-1/4" and diameter is 4-1/4". It is larger than a quart mug by just about a cup. I believe there has been a crow's foot restored on the underside of the bottom which does not affect the integrity of the piece in the least and there is a short line off the rim on the interior, I believe in the glaze as it does not go throught. Can't even feel it with my finger. This is a wonderfully bold example of Mocha in a not all that common pattern. 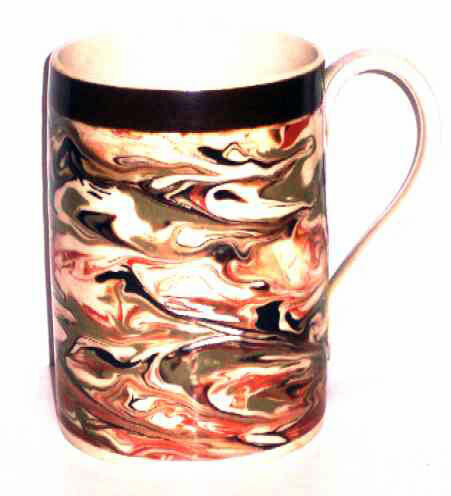 The colors are glorious and there is a wonderful sense of movement to the pattern.